The simultaneous attack on Loos by the British troops under Sir John French and General Douglas Haig opened on September 25, 1915. Preceding the assault, for five days, the British guns roared savagely all along the 80-mile front from the Belgian Coast to Artois. As in Champagne, the German parapets melted away, trenches were obliterated, the very air seemed choked with the infernal din. During the bombardment, squadrons of British airplanes flew over the battlefield, some signaling the range to the gunners, others dropping shells on railway trains and bridges. 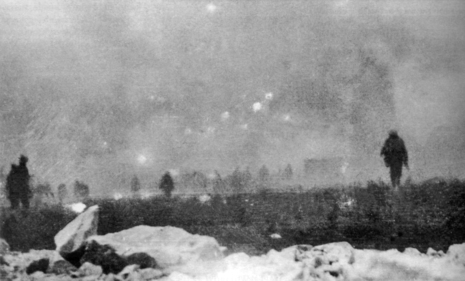 Thousands of gas bombs were dropped upon the German trenches at Loos, giving the Huns a dose of their own infernal medicine. Behind this poison cloud, the British infantry uprose, wearing gas masks. Advancing in four columns, they stormed the German line but were stopped short by an avalanche of bullets. Three successive assaults by one British division of 10,000 men broke under the German resistance. A fourth advance carried the Britishers over the German trenches, and two miles beyond. The First British Army seized the famous Hohenzollern Redoubt, captured the German guns and crossed the highway at several places. The Second British Army was equally successful in its early movements. 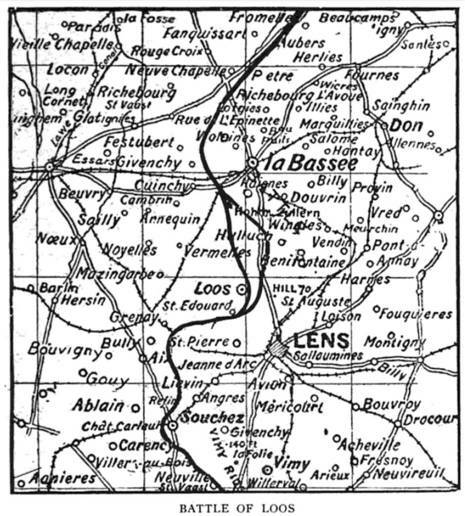 A Scottish division, after capturing the village of Loos, occupied the slopes of Hill 70, and even penetrated into the last German trench-line near Cite St. Auguste. Unfortunately, the British Reserves failed to support the advance and the brave Scots were left isolated beyond the German line. The Germans, strongly reinforced, returned to the fray. Before nightfall they had driven back the Scottish troops, retaken Hill 70, restored their line and begun a counter-offensive. Sir John French, appealed for aid to General Foch, and two brigades were sent to his assistance. But the Germans now were so solidly placed they could not be dislodged and the British assault, which had promised so much at the start, ended in failure. Though the British took 3,000 prisoners and 25 guns in this engagement, yet they lost 60,000 men, and all they had to show for this appalling loss was a dubious advance of two miles along a four-mile front. The battle of Loos, therefore, must be regarded as a British disaster. In consequence of this and other failures, a complete reorganization of the British military forces took place. General Sir John French was supplanted as commander-in- chief of the British forces by General Sir Douglas Haig, and Sir William Robertson was appointed chief of staff. 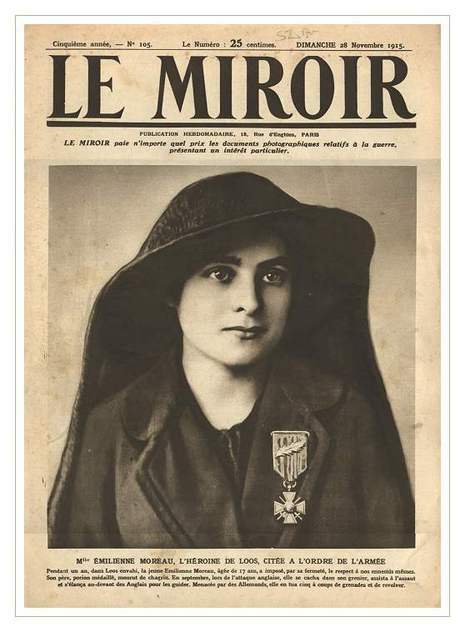 "The Joan of Arc of Loos"
In the shell-swept town of Loos, when the British took possession on September 25th, lived a 17-year-old girl, Emiliene Moreau, who was studying to be a school teacher. During the bombardment, while the shells were exploding round about her and the French poilus were falling by thousands, Emiliene had converted her cottage into a first aid station and, unassisted, ministered to the wounded. Two German snipers, through loopholes in a nearby house, suddenly began firing upon her improvised hospital, whereupon the brave girl armed her self with a revolver, boldly entered the house and killed them. Later in the day, two other German soldiers charged toward her with fixed bayonets. They, too, were sent to Walhalla by the bullet route. While going her rounds of mercy the next day, three more Huns endeavored to pierce Emiliene with their bayonets. With hand grenades given her by a British grenadier, Emiliene blew the Huns into fragments. On the eventful day, when the British line was wavering under what has been described as "the most terrible cyclone of shells ever let loose upon earth," Emiliene appeared at the front, waving the French tri-colour and singing the "Marseillaise." Inspired by her brave example, the British line stiffened and a retreat that might have endangered the whole front was averted. For these glorious acts of heroism, Emiliene was cited in the French Official Journal, and Sir Douglas Haig christened her "The Joan of Arc of Loos."